Sounds like they all attended the same “Military Academy”! SENDAI, Japan—Bank of Japan Gov. Haruhiko Kuroda said he would act quickly if the yen’s rise threatens his inflation goal, highlighting his caution over exchange rates ahead of a major international convention. “Be it exchange rates or anything, if it has negative effects on our efforts to achieve our price-stability target, and from that perspective if we figure that action is necessary, we will undertake additional easing measures,” Mr. Kuroda told reporters Thursday. The remarks by Mr. Kuroda come at a time of tension between the U.S. and Japan over whether the yen’s appreciation seen earlier this year is sharp enough to warrant intervention by authorities. Investors are closely watching whether Tokyo and Washington will continue to clash over yen policy during a meeting in northern Japan Friday and Saturday of finance chiefs from the Group of Seven leading industrialized nations. I´m being cute. Obviously central bankers must always be ready to act. I just wish that sometimes they really did! After all, the world economy situation is in such dire straits because of, on the one hand, from some lack of action and, on the other, from some bad ones. And going on to the G7 meeting we travel back thirty odd years to another “time of tension between the US and Japan”. In short, it seems the Yen can never depreciate against the dollar, in what is one of the most blatant cases of “currency discrimination” the world has ever known. If you don´t believe me, believe the data. In the first half of the 1980s, the dollar appreciated a lot against all currencies, except, you guess, the Yen! 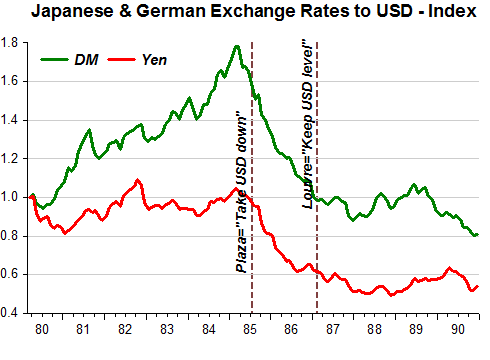 To make it visually clean, the chart compares the Yen and the DM against the dollar. When the sages gathered at the Plaza to “talk the dollar down”, then, yes, the Yen could appreciate freely! 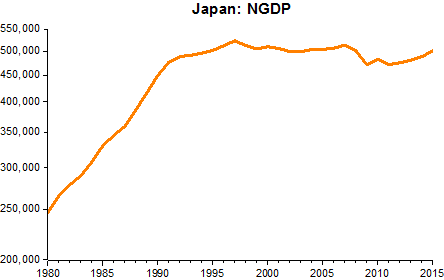 So, Mr Kuroda, never mind “hurting” the “feelings” of Secretary Lew. Just don´t let him force on you what Secretaries Donald Regan and James Baker forced on your predecessor in the 1980s! Every word and deed of central banks around the globe has been drawing more attention as the diverging directions of monetary policy among advanced economies become apparent. The issues I have raised so far are all complex, and there are no quick, definitive solutions for them. Nevertheless, I strongly believe that, at this one-and-a-half day conference, we will address the issues we currently face and find our way forward through lively discussions. I trust that many of you are familiar with the story of Peter Pan, in which it says, “the moment you doubt whether you can fly, you cease forever to be able to do it.” Yes, what we need is a positive attitude and conviction. Indeed, each time central banks have been confronted with a wide range of problems, they have overcome the problems by conceiving new solutions. I am sure that we all can share a conviction backed by our collective experience and wisdom. I would like to close my remarks now as we ready ourselves for discussion.